The main symbols of the city in Russia’s Pacific Coast are its famous lighthouses. Romantic or creepy, abandoned or in excellent condition, we take a look at the most picturesque ones. If you ask a Vladivostok resident the way to the lighthouse, they will immediately direct you to the Tokarevsky Lighthouse. There are several lighthouses in the city, but “the lighthouse” refers just to this one. The Tokarevsky lighthouse is at the very edge of the Muravyova-Amur peninsula, on which Vladivostok is located. This place resembles the edge of the world and is justifiably a popular tourist hotspot. The lighthouse is located on the end of a long sand bar (at high tide it submerges beneath the water completely), which is name the Tokarevsky cat after second-rank captain Tokarevsky, who worked as the primary minesweeper of Vladivostok at the end of the nineteenth century. From here the Russkiy Island and sea routes to China, Korea and Japan are visible. The Tokarevsky lighthouse was also featured in several movies. During the winter it is possible to see seals, resting on the ice floes or hunting for smelt. Getting to the other lighthouse of Vladivostok, bearing the name of Admiral Vladimir Basagrin, is not so easy. It is located on the land owned by the Ministry of Defence in the Patroclus Bay area. The lighthouse was first constructed as a wooden building in 1937, and was rebuilt in its current form as a stone structure with an 8-metre high tower in 1958. Recently the GLONASS system was established here, which improved the safety of navigation, but the traditional fire on top of the tower continues to be in demand. The Basargina Lighthouse is the favourite “natural” scene of local artists and photographers. It is frequently depicted in calendars and postcards: Dark blue sea and grey rocks, on which sea gulls build their nest, and the red and white lighthouse. It is best to view the Basargina Lighthouse from the sea by renting a boat. This lighthouse operates in tandem with the Basargina Lighthouse, constructed on Skrypleva Island alongside Vladivostok. During World War II, an anti-aircraft (and according to other sources — anti-boat) battery was located on this small island and was operated by women, as men were sent to the frontline. Remnants of the barracks have remained until this day, but the military no longer remains on Skrypleva Island — just the lighthouse. It is the oldest lighthouse of the Primorye Territory, having been built in 1876 and continues to be in service today. Combined with neighbouring Basargina, the lighthouse on Skrypleva Island forms a sea gate to Vladivostok: Skrypleva lights up in red, while Basargina is lit in green. Indeed it is on approach to Skyrpleva Island that captains ask for permission to enter the port of Vladivostok. Foreign vessels enlist maritime captains here. This is yet another lighthouse in the vicinity of Vladivostok, located near the village of Slavyanka. It is located on a picturesque and rocky cliff of grey basalt stone. The Bruce Lighthouse was built in 1911. Its original appearance is retained to this day: a white stone tower 10 metres tall, coupled with a one-storey building. Nearby is the old sea bell (ship’s bell), which helped send signals afar during cloudy weather when the lighthouse’s fire was not visible. Today in bad weather, modern equipment helps deliver the signal. On Asklod Island to the south of Vladivostok, one of the most interesting and inaccessible of local lighthouses is located. Several legends are also connected with this island. It was here in 1868 that the Manzovskaya War started (Manzo is what the Chinese who lived on Primorye were called). At the time, Chinese miners, who were illegally mining Asklod gold, came into conflict with the Russian authorities, having killed and wounded several sailors aboard the Aleut schooner. Then the hunghutz — Chinese bandits — burned the villages Shkotovo and Nilskoe (the current city of Ussuriysk). An attack was expected on Vladivostok, and only the intervention of the Russian Army was able to put an end to the conflict. In Soviet times, an air force town was built there, but was later abandoned — empty houses, water supply, a school and hospital still can be found there. Old residents say that in the 1990s, a new war broke out here over copper. Unemployed residents of Primorye pilfered the remaining scrap metal left from the military unit and town. Now, only the lighthouse located on steep coastal cliffs and its caretaker remain (we are not counting the visiting poachers). Heat is produced from a wood burning stove, while electricity comes from a diesel generator. There is no transportation to the island, but infrequently a gun boat will travel there with fuel and supplies. The current lighthouse was built during the Soviet period, but nearby the old lighthouse, built in the early 20th century, has been preserved. This lighthouse is located on a cliff, and reaching it is almost impossible because the staircase leading there is partially destroyed. The most unusual lighthouse, which describes the maritime nature of Vladivostok the best, is located near the Molodyozhnaya bus stop. It is located right on the roof of a house — a normal five-story Khrushchev-style building — and is clearly visible from the sea, as well as from the 100 years of Vladivostok Avenue. To be precise, it is still a “glowing navigational sign,” but in everyday life it is just referred to as a landmark lighthouse. This object, maintained by the Pacific Fleet, existed here during the days when this place was considered a suburb of Vladivostok. In 1960 after the visit of USSR leader Nikita Khrushchev the so-called Large Vladivostok Project was launched and the city began to grow rapidly toward the north. By law construction near naval installations was not allowed. But to make the so that the new street – 100 years of Vladivostok Avenue — would be straight, the naval authorities decided to make an exception and allow luminous signs to be moved on to the roof of a new house. 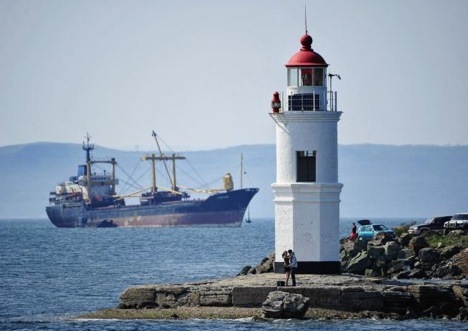 For almost half a century already, this lighthouse has served and helped ships moor in the Likhternaya harbour of Vladivostok.